Josh, glad you linked to the Flipping and Trading book again. Sometimes when I’ve had a rough day I just open it up to their Don Mossi description, or the Tommie Aaron card caption (“Why Tommy, why? ?”) and laugh myself back to happiness. I came across the Boyd/Harris book back in the 80s and — like so many other things in my life — I can’t explain to too many people just what makes it so wonderful. But you are a worthy keeper of the flame! Hall of Famer Dazzy Vance was a rookie with Brooklyn in 1922 at age 31. I don’t know much about Vance, except that for a long time I sort of thought of him as the third Dean brother. Wonder what took him so long to get it together. tom veryzer was also one of the topps up and coming phenoms! Imagine the left side of Tiger infield with Knox and Veryzer patrolling. I’m going to go out on a limb here are guess that the little Wilker has been born… If so, congratulations, Josh! A couple of days ago, I finished reading Cardboard Gods (the book, which Josh signed for me in Oakland a couple of months back). It makes it a pleasure for me to wish Josh a warm welcome into the land of fatherhood. I am going to second your guess bldxyz, congrats to Josh and the new family! Really interested to see how the next card is going to be incorporated into the birth experience! Give us a name, weight, etc, your long time followers from here and the old blog(and book of course), actually are interested. 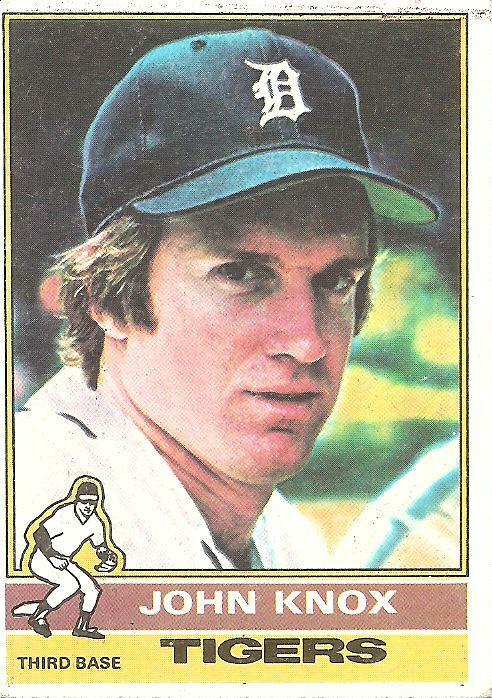 What I find interesting is John Knox is listed as a 3b by Topps, yet in 4 seasons he only played 4 games a third and 69 games at second. What inside info did Topps have that he would be the tigers third baseman? I remember having Ed Kirkpatrick 75 card and he was squatting in a catcher position. I thought he was a primary catcher…..when in reality he only played 6 games at catcher and 90 plus at other positions.